Bibra.eu » Goodbye Compaq, Hello Lenovo! For a long time – actually since 2008 – I had been using an old Compaq Evo N610c business notebook as my primary work computer, but in addition to being seriously underpowered nowadays and rapidly losing screen brightness, it has been giving me some other trouble recently as well. Earlier this year, my last large harddrive failed and because 2.5″ IDE drives are nearly impossible to get now that SATA has taken over, I have been reduced to using the laptop with one of the two last 40GB drives I had in reserve. The last straw was only a couple of days ago when it suddely didn’t want to turn on anymore – after removing the optical drive and the battery, the problem suddenly vanished again, but now I fear that this might happen again and the laptop could finally stop working completely. Because of the difficult harddrive situation, I was already looking for alternatives and found out that the IBM/Lenovo Thinkpad series has already been supporting SATA drives at least since the T60 series, which has become quite inexpensive on eBay recently. Although I had not intended to buy a new laptop this early, the slowly failing Compaq worried me so much that I finally made the decision to do it right now – and last week, I snagged a very nice Thinkpad T61 with a big 15.4″, 1280×800 display, 2GB RAM and a 1.8 GHz Core2Duo processor. It’s not a brand-new machine by any means, but still a huge upgrade over my old laptop. The amazing thing is that I bought it from the same seller I got my Compaq notebook from back in 2008 – a dealer who refurbishes leased computers and gives a one-year warranty on used articles, so I’m on the safe side. It arrived yesterday and as expected it is in amazing shape – the only signs of use are some small scratches on the lid and otherwise it looks like completely new. The only part I will probably replace soon is the 80GB harddrive it came with, mainly because I want to put something bigger into the laptop, but also because it has a somewhat high power-on hour count. It also came with an unexpected and very welcome surprise: a built-in sd card reader in front of the palm rest, something which I had not expected at all. There was absolutely no driver trouble when I installed Windows 7 and everything works perfectly. I expect that in a couple of days I will have everything up and running again and then I can finally do some work without being interrupted by ageing hardware! 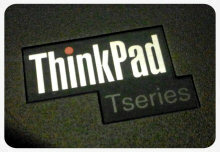 This will only be my fifth notebook, but my first Thinkpad. I guess I should write a retrospective blog post on all those machines that came before it – except one of them, all are still around in working condition! This will be an interesting project for the fall, so stay tuned :-).